This section poses questions to help the inquirer determine whether the work meets the definition of having been published, as codified within U.S. copyright law. Performance or display of a work is not publication. Even nationwide broadcast of a work has been ruled to not be publication. Copyright does not protect ideas not put into tangible form. If the work has remained under the control of its creator, without copies being sold nor the work being provided to others for further distribution, it is not a “published” work. “LP” and “MP” in a Copyright Office registration number indicate that the registration was processed as a published motion picture. “LU” and “MU” indicate that the registration was processed as an unpublished motion picture. Published works copyrighted 1909-1977 were entitled to an initial term of 28 years and to a renewal term. The renewal term (counting later extensions) was 47 years for works copyrighted before 1923, and 67 years for 1923-and-later works. Published works copyrighted 1978 and later receive different terms depending upon whether registration was by a corporation as opposed to a person (or persons). Works copyrighted by persons are protected for the life of the creator(s) and seventy years thereafter. Unpublished works are entitled to copyright for the life of the author plus a number of years afterward. For some works for which authors have long been dead and publication occurred by 2002, copyright duration extends through 2047. Unpublished works that were registered for copyright with the Copyright Office from 1931 to 1963 were subject to the same rule as published works that copyright be renewed during the final year of the first term of copyright. Failure to renew resulted in permanent loss of copyright protection. For specifics on the lengths of terms of copyright, see the copyright duration table on the tree-view chart page. 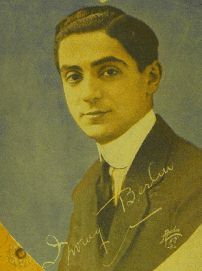 With motion pictures and television, a large number of strangers — potentially the entire population of the United States — can be offered a chance to view a work, and yet the courts have said this amounts to at most “limited publication” rather than full-fledged publication as dealt with in some strict portions of the copyright laws. The preceding continuums were created by the copyrightdata.com editor. These continuums do not have a parallel in the copyright statutes. Nonetheless, the delineations drawn above are ones that are made in court decisions, in isolated passages of the Copyright Act, and in the writing of a respected scholar of copyright law. The condition in the layer at the top of each of the three continuums is a manifestation of indisputable publication. A creator whose work has been distributed in the manner outlined must accept that his work has achieved the legal threshold of publication, and such a creator or publisher must accept that he must comply with any applicable registration requirements if copyright protection is to be accorded by law. On the bottom layer of each of the three continuums is a condition which is indisputably an instance of a work not published. In such cases, the creator has always been protected by law (if not statutory law, it was common law), limited only by time restrictions imposed in the 1976 Copyright Act which eliminated protection for works still not published decades after the death of the creator. In the middle layers of the continuums are various gradations between indisputable publication and indisputable lack of publication. Those closest to the extremes are really just slightly different manifestations of publication and lack of publication which are itemized here only so that readers here can better understand that these conditions are mere variations not worthy of special legal status. Nearest to the center of each continuum are the indistinct “borderline” cases which have required learned specialists in copyright minutia to discern the legal status. Some of these conditions have resulted in verdicts that “limited publication” has taken place, with consequent carefully-structured decisions affecting the rights of copyright holders. Key court decisions in this area are summarized on the “limited publication” Citations and Case Summaries page of this web site. Knowing when a work was created is not enough to determine the expiration date of the copyright. For works first published in the United States before 1978, the term of copyright is determined by the date of publication, not the date of completion or of the creator’s death. (Works published after 1978 other than those copyrighted by corporations are granted a term of copyright lasting the lifetime of the author and a specific number of decades thereafter.) Because publication started the clock on a copyright in the 19th century, some works created during those one hundred years continue to enjoy copyright in the 21st century. Emily Dickinson lived from December 10, 1830, to May 15, 1886, writing nearly eighteen hundred poems during her lifetime. However, only about a dozen of that large output were published while she was alive. A posthumous selection was published as a collection in 1890, and additional volumes were published during the 1890s. Starting in 1914 and continuing through the 1930s, a series of volumes was published, with many previously-unpublished poems going into print for the first time. As of year 2008, any work copyrighted 1923 or later still enjoys copyright (assuming compliance with requirements), so the combination of facts outlined here means that a poet who had been dead 37 years in 1923 was having works of hers start terms of copyright that would extend 95 years after that. Works published for the first time the following decade will be in copyright even further beyond Dickinson’s death. Had she lived more than a century later and had not published anything until 1978 or later, all of her works (whether or not published in her lifetime) would have copyright expire at the same time — ninety-five years after her death. Had she died a British citizen in late 1911, all of her works would have had copyrights lasting her lifetime and fifty years thereafter, and thus all would have expired at the same time. Because she was an American at a time when copyrights lasted a fixed, uniform period of time beyond publication, her works could remain in copyright a long time provided her heirs were willing to ration them, doling them out at intervals. The saga of Dickinson’s copyrights doesn’t end with the series that went into the 1930s. In 1955, an edition was published of Dickinson’s poems that respected the stylized punctuation and capitalization of Dickinson’s originals, without the editing of earlier editions. As a result, aspects of the poems unique to the 1955 edition when Thomas H. Johnson published it may enjoy copyright further into the future than will the altered earlier versions. Examples of long-unpublished work are not confined to that of a reclusive poetess or to works enjoyed in books or magazines. The lengths of terms can be determined from the tables on the tree-view chart page. The tables are separated between published and unpublished works, and within tables by year of publication, lifetime of creator, and whether the copyright claimant is/are individual(s) or a corporation. 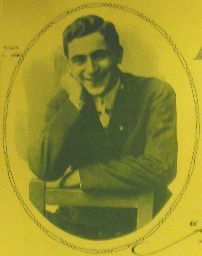 Illustrations: portraits of Irving Berlin which appeared on sheet music of his songs in (top) 1919 and (bottom) 1914. Why would it be necessary to guarantee that starting 1978 “in no case will copyright in a work of this sort expire before December 31, 2002”? A simple answer: There were works that had never been published which were created by people who had been dead more than half a century. A follow-up question: Why be concerned about works that no one was interested enough in publishing even when the works were new and the authors able to promote the works? An incredible answer: A valuable work could surface worthy of as much legal protection and public attention as contemporary best-sellers. Different editions of the same work may be sufficiently different as to mislead people as to what level level of copyright protection might be enjoyed by a particular edition of the work. 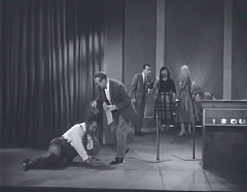 The first six images are from a 1959 television program which illustrates the point. 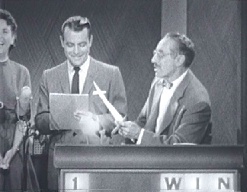 When You Bet Your Life was first broadcast, it was transmitted nationally on a single evening on a single network. No copyright registration was taken out, nor was a copyright notice put onto the program. The program could be regarded as unpublished, which meant no formal copyright actions were necessary. The top three images on the left are of this network (unpublished) version. 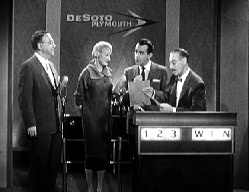 250 episodes of the series were subsequently sold to local stations through syndication. With each station having its own copy of each offered episode, it can be validated that publication had now occurred. 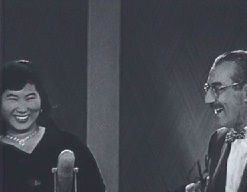 The syndicated episodes were retitled The Best of Groucho and each carried a 1961 copyright notice. The top three images on the right are from the syndicated (published) version. Note the differences. 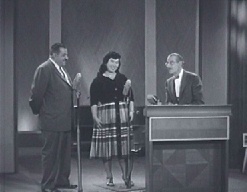 When the show was syndicated, the image was cropped so that viewers to a local station would not see the “NBC” on the microphone. 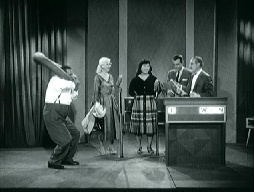 Viewers to the network broadcast (left) had seen a sponsor’s logo on shots filmed from a particular distance. Local stations sold advertising separately from the networks, so the original advertising was not incorporated into the copies delivered to local stations. 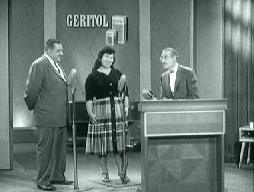 When the series filmed this January 1958 broadcast (see left), the sponsor’s logo was physically part of the background. The image at right (from syndication) demonstrates how that logo was removed. The image was cropped to eliminate the top, necessitating removal of picture area at the sides. Half of the woman went outside the frame. Notice that the “NBC” on the microphone has been obscurred by light added optically. At left: the copyright notice which appeared on all Best of Groucho episodes syndicated. (The year in the notice represents the delay between network broadcast and syndication sale.) The original broadcasts did not require notice and did not have them. The above statements about “Published” and “Unpublished” statuses refer to the laws in effect at the time of the network broadcasts and the initial syndication. When the full, uncropped version of these particular episodes of the program was published on DVD in 2004, it was with a copyright notice and was under new laws that (a) don't require copyright notice for copyright to be enforceable and (b) don't require copyright registration for copyright to be valid. On August 9, 1930, movie producer Hal Roach previewed a cut of his comedy Pardon Us. The length was 70 minutes. More recently: yet another new version of the 65-minute edition was assembled, this time adding repeated bits of musical soundtrack to cover up the silences. Beginning with works published March 1, 1989, copyright notice is no longer required, and it remains the case that registration is no longer required. This version will remain under copyright even when earlier versions have entered the public domain, because it contains new editing. Although this latest version no new material — just new repeated use of snippets of music already protected by prior copyright on the release version of the film — it is a new work. As with all new works that utilize earlier works, the new copyright does not extend the copyright protection on the earlier releases. The illustrations page on copyright renewal and the illustrations page on researching copyright status provide additional information about renewal registrations. The provisions under copyright law permitting new copyright protection for new material (and even new editing) are covered in the illustrations page on derivative works. East of Borneo was a feature-length movie produced and released by Universal Pictures in 1931, starring the talented but later-unsung actors Charles Bickford and Rose Hobart. Universal copyrighted it as a published motion picture photoplay August 24, 1931, registration number LP2424. After distribution to theaters on 35mm film, it was made available on 16mm. Joseph Cornell was a New York-based artist who rather than using paint, plaster or marble instead rearranged “found objects” (including images). His first foray into using movies for this purpose was in rearranging a 16mm print of East of Borneo into a short film made up of some chronologically-jumbled shots from the feature, often those focusing on the leading lady, whose name became the title of his avant-garde short: Rose Hobart. One showing took place in 1936, and that was in an art gallery. After that, there would be no more public exhibitions for over two decades, and then when there were, display of the work would again occur in art galleries. Only one print was in existence. (This situation didn’t change until after the short developed a reputation of being culturally important. In 1969, Anthology Film Archives obtained the original and made copies.) The work was being exhibited and performed, but was not published. Rose Hobart didn’t require formal copyright notice or registration for the reasons given above. The manner of distribution simply differed far too markedly from those of East of Borneo which had necessitated formal copyright notice and registration on the 1931 film. Additional information concerning East of Borneo and Rose Hobart is provided on the illustrations page on copyright registration. The closing credits of this episode of the 1950s American television series Front Page Detective makes clear that the production company was different from the distributor who contracted for sales and deliveries to local stations all over the country. Under the Copyright Act in effect from 1947 to 1977, “In the interpretation and construction of this title ‘the date of publication’ shall in the case of a work of which copies are reproduced for sale or distribution be held to be the earliest date when copies of the first authorized edition were placed on sale, sold, or publicly distributed by the proprietor of the copyright or under his authority […]” (§ 26). 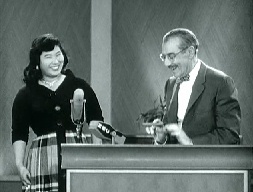 As explained above regarding the You Bet Your Life/Best of Groucho series, the mere broadcast (what the law calls “performance”) of an episode does not constitute its being published. 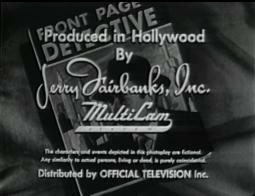 An owner may keep such a tight control over a work that it can be deemed never to have “published.” However, the passing of control from production company to distributor to local stations, as occurred here (shown by the facts stated on these title screens), demonstrates likely publication. only concern aspects of these works relevant to Publication.